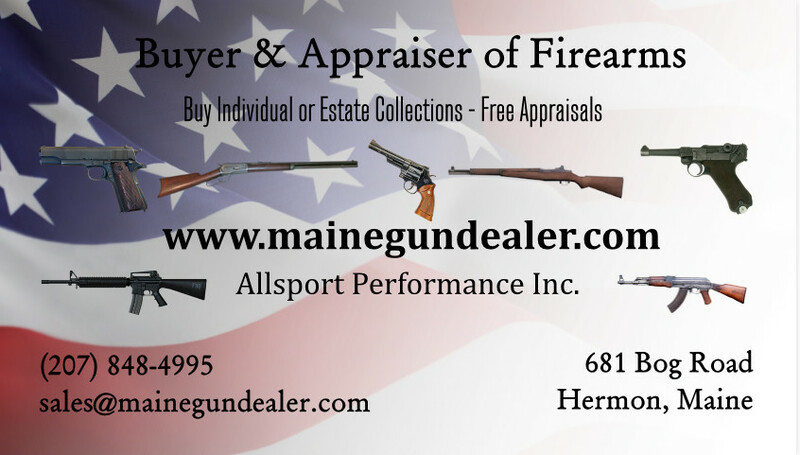 Free firearm and militaria appraisals in the state of Maine. I will research what you have by using a library of books, online searches, current prices guides, recent ended online auctions, and years of experience. The market is always changing and sometimes even the current blue books are low and sometimes they are high. As collector as well so I know what my customers will pay for firearms. If there is something I am not familier with I will take the time to research the firearm or collectable and contact other experts to help if needed. I will give you a an honest value. Appraisals are a great asset when it comes to insurance coverage. Also you might be hunting, carrying, or storing (in less than acceptable conditions) a gun that is worth a lot more than you think. Wear and rust can case of firearm to decrease in value by a lot. I can help you with complete estate collections. I have a broad knowlege of antiques, collectables, and firearms. I collect antique, vintage, Civil War, WWI, WWII, Korean War, and Vietnam war firearms and military collectables. Also I have a large collection of antiques such as vintage and antique hunting & fishing items, signage, gas and oil, metal toys and more. I can give you estimated values on those items as well. I have helped several customers over the years with estate collections. Some have no one to help them, feeling overwhelmed with the passing of a loved one, did not trust the people coming out of the woodwork to buy guns from an estate, or did not have the knowledge to reseach themselves. Appointment may be necessary depending on the amount of firearms you have. If you have 20 firearms of less usually I can work you in during normal business hours without an appointment. I am available to look at large collections before or after hours Monday-Saturday or on a Sunday. I will travel within Maine to look at your collection. Because I have a family it can be difficult for me to travel while school is in session during the week. My children go to a private Christian school with no buses. Your information will be kept private and confidential. We do not offer appraisals, trade value, or estimates of purchase price via email, Facebook, or phone. Beware of those that will. Sometimes they tell you a higher number just to get you in the door then they tell you it is not what they thought or the condition isn't as good as you described and offer you a much lower value. We purchase firearms and collectables as well. See the Buy, Sell, and Trade page by clicking here.